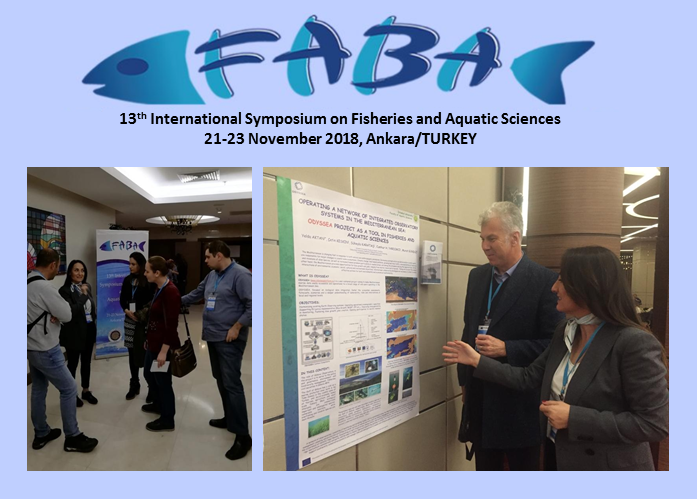 The EU-funded ODYSSEA Project was given pride of place at Turkey’s 13th International Symposium on Fisheries and Aquatic Sciences (FABA), held November 21-24, 2018 at Ankara University. During the congress, the Turkish ODYSSEA project team gave a presentation describing the Gulf of Gökova Observatory, which is one of the automated observatories included in the ODYSSEA project’s Mediterranean data collection network providing information for end-user platforms. The observatory will help promote objectives related to environment and biodiversity management and fisheries, as well as those related to policy, governance and civil society, the team members noted. “We received valuable feedback during discussions with other Symposium participants regarding the present situation, possible knowledge gaps and requirements of end-users in the Gulf of Gökova and the Turkish coast of the Eastern Mediterranean. Furthermore, we interacted with other aquaculture sector employees who will be the end users of our project to better understand how our ODYSSEA project can be of value and service to their activities in Güllük Bay, Bodrum, the heart of the fisheries sector in Turkey,” ODYSSEA Turkey team members said. The Gulf of Gökova is an important marine protected area in Turkey, where socio-economic interests based on tourism, agriculture and local fisheries overlap with ecological interests related to endangered species and vulnerable habitats. Overfishing and invasive species are seen as the primary threats. In their presentation, the ODYSSEA Turkey team described the ODYSSEA project’s overall goals and vision, foremost among them being to collect and standardise marine data, and to provide an operational and easily accessible marine database to a wide range of end-users throughout the Mediterranean, by means of the local observatories and platforms. Other ODYSSEA objectives noted were: to harmonise existing earth monitoring systems, upgrade operational oceanographic capabilities, support the implementation of EU policy aims (such as Blue Growth, MSFD and CFP), improve interoperability of monitoring initiatives, foster blue-growth job creation, and facilitate participation from countries outside of the EU. The FABA symposium has been held since 2003 to bring together scientists and other professionals working in fisheries and aquaculture from all around the world. This year, more than 300 registered participants represented various universities, governmental organizations, private corporations and public institutions and many contributed to the symposium program, which included 110 oral presentations and poster sessions. Topics covered during the symposium included fish and fisheries; aquaculture; biotechnology and genetics; aquatic biology; nutrition feeds and feed additives; fish disease, control and welfare; water pollution and hydrobiology.